CoffeeFresh Water Filters keep your Cuisinart Coffeemaker water clean and odour-free, ready to deliver cup after cup of delicious, fresh-tasting coffee every time. The joy of coffee may be "all about the beans" but did you know that coffee is 98% water. 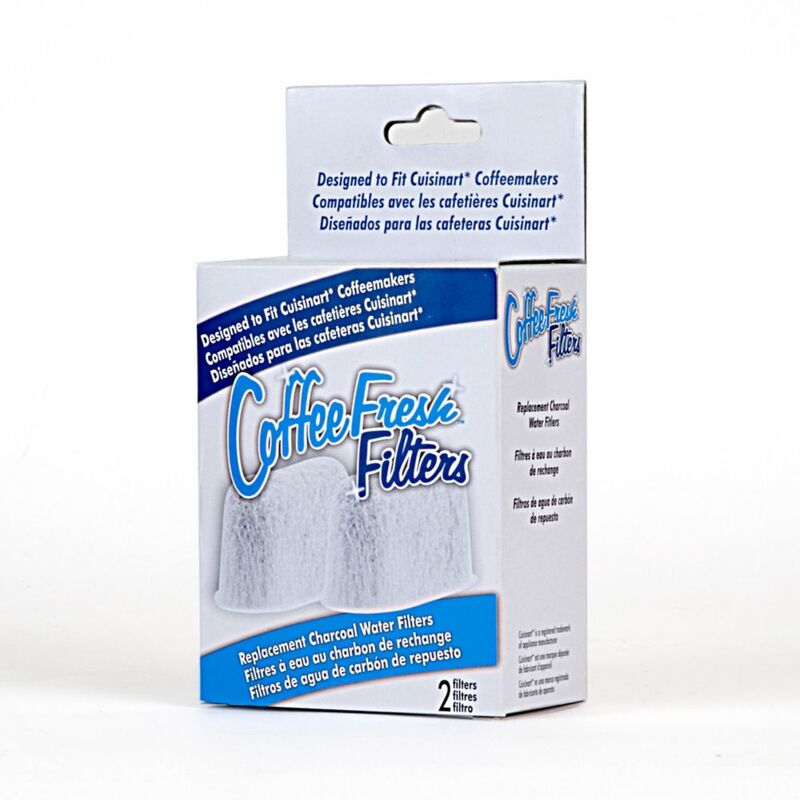 CoffeeFresh filters efficiently remove chlorine, calcium and other impurities that naturally occur in tap water, and leave behind only fresh, clean and great tasting water for a perfect cup of coffee. Our filters are designed to work with any Cuisinart Coffeemaker that includes a water filter holder. CoffeeFresh filters for Cuisinart are super easy to use, install within minutes with no mess or hassle. Our filters will keep your coffee tasting fresh and delicious and last up to 2 months or 60 tanks. 1 Package of CoffeeFresh for Cuisinart contains 2 filters. Hotter coffee and brew strength options the best of both worlds! The Cuisinart 14-Cup Programmable Coffeemaker is equipped with cutting edge coffee technology to give you hotter coffee without sacrificing taste. Choose a flavour profile with regular or bold strength control, and set brew-time up to 24-hours ahead. Our backlit LCD is easy-to-read, a ready tone can be turned on or off, and an indicator light signals when its time to decalcify. CoffeFresh Descale & Cleaner is the ideal concentrated descaling solution for both home and industrial appliances. Our concentrated formula uses citric acid, aluminum salts and sulfamic acid to powerfully and safely dissolve lime scale, minerals and oils that are left over from normal everyday use. Each package comes with 4 pre-measured packs that simply dissolve, brew and mix to keep your appliance components clean and your beverages tasting fresh. Use as required to keep your appliances functioning optimally. Try our 2 Pack (2 Packages with 4 packets in each package). CoffeeFresh Water Filters For Cuisinart CoffeeFresh Water Filters keep your Cuisinart Coffeemaker water clean and odour-free, ready to deliver cup after cup of delicious, fresh-tasting coffee every time. The joy of coffee may be "all about the beans" but did you know that coffee is 98% water. CoffeeFresh filters efficiently remove chlorine, calcium and other impurities that naturally occur in tap water, and leave behind only fresh, clean and great tasting water for a perfect cup of coffee. Our filters are designed to work with any Cuisinart Coffeemaker that includes a water filter holder. CoffeeFresh filters for Cuisinart are super easy to use, install within minutes with no mess or hassle. Our filters will keep your coffee tasting fresh and delicious and last up to 2 months or 60 tanks. 1 Package of CoffeeFresh for Cuisinart contains 2 filters.